Being an discourse on diverse topics concerning the history and wargaming of the War of the Spanish Succession. Here is one of the three letters about a battle near Scharding, in March of 1703. It was written by a M. de Ricous. The Marquis de Ricous, the French Minister to Bavaria, was apparently not all that well liked by Villars. The letter gives the impression that the Minister was on active campaign with the Elector of Bavaria. M. de Ricous was also behind the raising of the "red grenadiers" in the Bavarian army (more later). To sum up, a Bavarian force from Scharding attacked some outpost of Graf Schlick, consisting of the regiments Schlick and Hanover. About four to eight miles beyond that was the village believed to be Schlick's HQ, but he had removed himself to Passau. This HQ village, though, still had a force of Saxon cavalry (15-16 squadrons) and about a battalion of infantry as an artillery guard (for an artillery park with at least 4 large cannon, 4 mortars, and a bridging train). Even after these reverses, Schlick had 12000 men. Still need to know what forces were in the area, including what General Stirum was commanding. A Bavarian Grenadier, with Grenade! We left, my lord, the 11th from Scharding, at five in the morning to seek Count Schlick, whose troops quartered beyond the Inn. We first came upon the regiments of Schlick and Hanover, whose quarters were within musket shot from one another. They defended well enough, but finally they were routed and put to flight, and we pursued them as the country, which is only low and close, would permit it. His Electoral Highness then marched to a village, two hours away, where he was told that was their headquarters. He learned by the prisoners, that Count Schlick was in Passau, where he had thrown his infantry on the rumor that we were to attack; but the Saxons were in that village with artillery. We found them in a line of battle of fifteen or sixteen squadrons and four to five hundred infantry, who were to guard the cannons. They fired on us, at our arrival, a few salutes of their artillery, and we amused them by skirmishing, while our troops, who mostly could not walk any further, might form a part of our infantry which came first made them give up the cannon, and at the first movements of our cavalry, they marched by their right to retire in defile which was only half a musket shot away; but there they were pursued so vigorously for about two miles, they were entirely defeated. We have over five hundred prisoners, seventeen or eighteen banners, four pieces of heavy cannon, four mortars, all the munitions of war, all the paraphernalia of a bridge, and all the looted luggage; a Saxon Major General, a colonel, a lieutenant colonel, a major, two captains and other officers prisoners. I simply have the honor, my lord, to inform you of the whole business that is very important in the situation where we are. We hope to give the same treatment to General Stirum. It will be necessary to do even more before we are done with the business. Count Schlick still has twelve thousand men. We prefer to approach you, to be in range of news from you, and run the project with your response to this letter as his electoral highness will decide. PS I had the honor to write to you a eight days ago, by three different routes, and I have not received for over three months, one of your letters. We go after tomorrow to the Danube. Nous partîmes, monseigneur, le 11 de Scharding, à cinq heures du matin, pour aller chercher le comte de Schlick, dont les troupes cantonnaient au delà de l'Inn. Nous tombâmes d'abord sur les régiments de Schlick et de Hanovre, dont les quartiers étaient à portée de mousquet l'un de l'autre. Ils se défendirent assez bien, mais enfin ils furent enfoncés et mis en fuite, et on les poursuivit tant que le pays, qui n'est que bas et défilés, le put permettre. Son altesse électorale marcha ensuite à un village, à deux heures de là, où on lui avait dit qu’était le quartier général. Elle apprit, par des prisonniers, que le comte de Schlick était à Passau, où il avait jeté son infanterie, sur le bruit qui courait qu'on le devait attaquer; mais que les Saxons étaient dans ledit village avec l'artillerie. On les trouva en bataille au nombre de quinze ou seize escadrons et quatre à cinq cents hommes d'infanterie, qui étaient pour la garde du canon. Ils nous firent, à notre arrive, quelques saluts de leur artillerie, et on les amusa par quelques escarmouches, en attendant que nos troupes, qui la plupart du temps ne pouvaient marcher qu’un à un, se pussent former Une partie de notre infanterie qui arriva leur fit d’abord abandonner le canon, et aux premiers mouvements de notre cavalerie, ils marchèrent par leur droite, pour se retirer dans un défilé qui n’était qu’à demi-portée de mousquet; mais ils y furent poursuivis si vivement pendant près de deux lieues, qu’ils ont été entièrement défaits. Nous avons plus de cinq cents prisonniers, dix-sept ou dix-huit étendards, quatre pièces de gros canon, quatre mortiers, toutes les munitions de guerre, tout l’attirail d’un pont, et tout le bagage pillé; le général major des Saxons, un colonel, un lieutenant colonel, un major, deux capitaines et d’autres officiers prisonniers. J'ai l'honneur simplement, Monseigneur, de vous informer du gros de l’affaire qui est très importante dans la situation où nous sommes. Nous espérons bientôt aller faire le même traitement au général Stirum. Il s’en faut encore beaucoup que nous soyons hors d’affaire. Le comte de Schlick a encore douze mille hommes. Nous aimons mieux nous approcher de vous, pour être à portée d’attendre de vos nouvelles, et d’exécuter le projet dont votre réponse à la lettre de son altesse électorale décidera. PS J'eus l'honneur de vous écrire, il ya huit jours, par trois voies différentes, et je n'ai reçu, depuis plus de trois mois, qu’une seule de vos lettres. Nous remontons après-demain le Danube. Since I have so many Bavarians, I need battles for them to fight. Here is something I could work from that I found in the Digital Archives Marburg. It is the bombardment of Schardingen, 25-27 Aug 1703. This is not the Schardingen in lower Saxony that you'll find with a Google search. Note that the river is the Inn and the roads are going to Neuburg and Passau. So, this engagement was at the modern town of Schaerding in Austria. The original title is "Entwurf der Churbeyerischen Vestung Schardingen wie dieselbe vom 25. Aug. Abends um 10 Uhr bis den 27. Dito Morgens um 2 Uhr  von denen Kayserlichen unter Kommando vom H. General Major von Revenklau ist bombardirt worden"
General Major von Revenklau is most likely Christian Detlev Graf von Reventlow, a Danish general who briefly was in Imperial service. It appears that units are represented as one block per battalion or squadron. Regiments of cuirassiers are colored in yellow. Dragoons are blue. Infantry is red. It appears that only the Imperial forces are depicted on the map, including a number of Danish auxiliary units that were quickly hired at the start of hostilities. "Pr: Hanov: Curas". This is most likely the Austrian regiment: Prinz Hannover Cuirassiers, and there are four squadrons deployed there. (Tessin: Imperial 1672/1). "Marcus Aarnberg". I'm not sure who this infantry battalion is. "Revenklau". This battalion may be the Austrian regiment of Graf Christian Detlef Reventlau (Tessin: Imperial 1694/1), but so far, I'm finding it spent the early part of the war in Italy. Maybe this engagement was on the way south? "Dittmar". These four squadrons are colored as dragoons, but I think this is the unit usually known as Dithmersen Kurassiere, commanded by Nikolai Henrik Ditmersen. (Tessin: Denmark 1702/1). They really only became cuirassiers in 1704 or later. "Hermanstein". This battalion may be Herberstein, but I just don't know yet. In front of this arced line of troops are three batteries formed for the bombardment. "D" marks a battery of 16 cannon. "E" is another battery of 4 cannon. "F" is a battery of 4 mortars. In advance of the batteries, and also placed to cut off communications on the other side of the river, are six posts of (something illegible) marked "C". "Schlick Drag". One squadron detached as part of the covering force on the right bank of the Inn. "Dittmar Dan.". Another detached squadron. commanded the Imperials against the Elector of Bavaria himself. Schlik's force amounted to about 10,000 men. One account puts the battle on the 10th of March, a second one the 11th, and another on the 14th. These three accounts merit a little closer reading and working out the full translation. That is for another posting. Now, the whole army had only 6 battalions and 11 squadrons, so I'll almost finish it without adding a single new figure. I still need to figure out how to use the cavalry figures spun off by rebasing. That's coming. Hang on. Look at this! It's just too many Bavarians for any practical need. 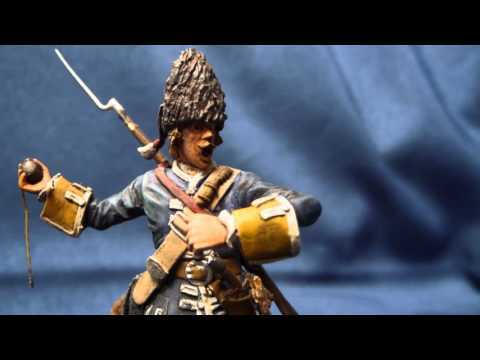 I had 11bn, 21sq, 20 guns, which would stand in for about any Bavarian force that I'd need-- if you were willing to keep a dragoon regiment and Boismorel's Grenadiers in the field after 1704. 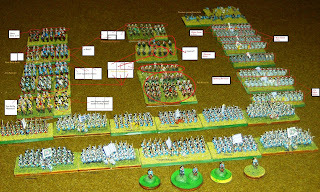 Then I bought 8 stands of 24 inf and 4 stands with 32 cavalry. This is screaming for reusing some figures as the army of the Archbishop of Cologne, or padding out my foreign (German) regiments of the French army. 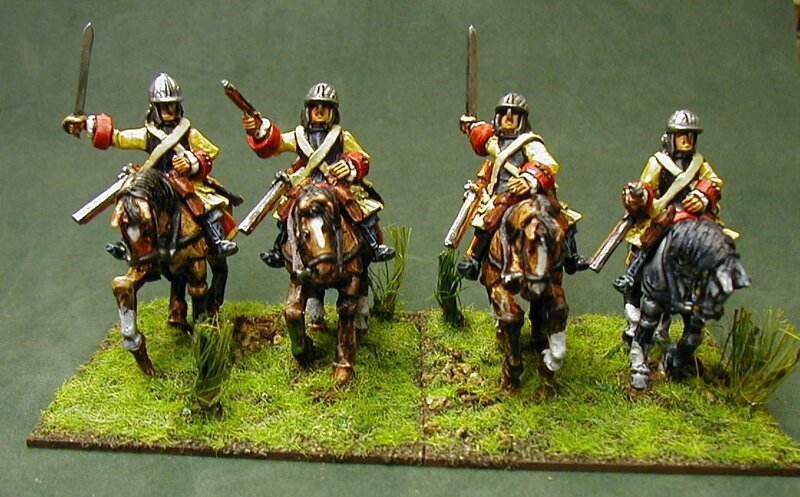 Leibregiment: 3 redundant horse grenadier figures will sit a while. 6 in hats, with minor repainting, form a squadron of the Prinz Philip carabiniers. Arco Kurassiere: 27 fig in hats receive 9 from Pr Phil, above and are complete. The 27 in helmets and blue facings will split up with 18 going to a new regiment (Poth) and 9 going to Wolframsdorf. Wolframsdorf Kurassiere: 27 in helmets and green facings. Receiving 9 to repaint from Arco in helmets. Poth Kurassiere: Red facings. Have none. Need 36 figures. 9 in buff and blue. 9 in buff and red and 18 in blue and blue. This is most of the repainting that will be needed. This leaves 5 more misc figures in helmets redundant that might form a squadron, but for whom? What's the end state: 12 bn Bavarians, 4 bn Colognais, 36 sq Bavarians, 2.5 misc squadrons, plus the artillery. I'm looking to stretch my troops and get them based to be cross-compatible with Polemos and Ga Pa.
That means my cavalry, formerly in 3 ranks of 3 on a 20mm x 40mm base will go to 2 ranks of 3 on a 20mm x 30mm base. Then a single base will be a single squadron in Ga Pa and three in a line will be a brigade (regiment) in Polemos. It also means I'll be spinning off new units left and right by only painting a few extra figures and hopefully without doing much repainting. For the infantry, all the 3-rank, platoon firing infantry that had a frontage of 80mm will be going down to 60mm. In the process, each will shed about 8 figures. That means for every 4 battalions, Icould get one more, but we'll see how that plays out with the desire to do little repainting, too. from Pelet & Vault, "Memoires Militaires", vol IX, pages 16-17. J'ai l'honneur d'écrire à sa majesté, monsieur, pour l'informer de l'ébranlement de toutes les troupes des ennemis. Je prends mes mesures pour rassembler l'armée du roi; vous verrez, par les lettres de M. le comte de Bergeyck, qu'il faut commencer par retrancher toutes les troupes de Bavière et d'Espagne. Peut-être en sera-t-il de même de celles de Cologne. Ce qui me fait le plus de peine, c'est que tout ce projet, que j'avais fait pour me placer de bonne heure derrière la Bassée, ne peut s'exécuter présentement, pour n'avoir pas actuellement deux mille huit cents sacs de farine; et, depuis trois jours, l'on ne vit que de ce que l'on tire des places par force. Ces quinze mille sacs dont je vous avais porté l'état et que j’ai eu l'honneur de montrer au roi sont réduits à trois mille sacs de farine, parce que l’on en a consommé et parce que l'on n'a pas encore commencé à moudre les premiers sacs de M. de Sailly, et que l'on n'a pas le premier de ceux qui devaient sortir d'Albert. Les dix mille sacs de M. d'Ormesson ne seront ici que dans le 15 ou 20 juin; les premiers peut-être plus tôt, mais les derniers n'arriveront que dans ce temps-là, et puis il faut les faire moudre. Sur les six mille sacs de farine qui devaient arriver de Verdun, M. Doujat en avait pris trois mille avant vos ordres, et je l'ai prié de faire passer incessamment les trois mille autres. Vous verrez, par la lettre de M. de Saint-Contest, ce que nous pouvons attendre de lui. Il est très-surprenant que les gouverneurs des places qui ne seront assurément pas assiégées n'envoient pas tout ce qu'ils ont. Le sieur Fargès veut tout abandonner, et je lui écris la plus forte lettre qu'il m'est possible pour le ranimer. Il n'est pas arrivé une pistole de tout ce Que l'on m'avait promis. Vous voyez à quoi je suis réduit. La tête ne me tournera pas, car, Dieu merci, je l'ai bonne ; mais l'état est violent. Le sieur Paris devrait être ici. Raffy est troublé quand je lui parle. Il n'a rien. Je n'entends point parler des caissons dont MM. les intendants pressent l’arrivée depuis longtemps pour voiturer les grains qui viennent de Picardie. Je commencerai à faire donner la viande après-demain. J'espère, monsieur, que vous aurez donné de bons ordres pour qu'il en arrive. Vous trouverez, je crois, qu'il est temps de faire partir les officiers généraux.